Massages for the kitties in your life are available, too! This includes feline massage, both in-house and mobile, and in future, rabbits, ferrets, chinchillas and more. Beyond massages for dogs I offer massages for cats. For those cats that are reluctant to travel (and most are), I can arrange to come to your home, where your cat is most comfortable. Make sure you have a cool, quiet room available with space on the floor for my massage bedding, or if your cat is willing to sit in my lap or beside me, they can be massaged on a couch. It is essential to create a calming atmosphere with no interruptions (human or other pets) so your cat can receive the full benefit of the treatment. 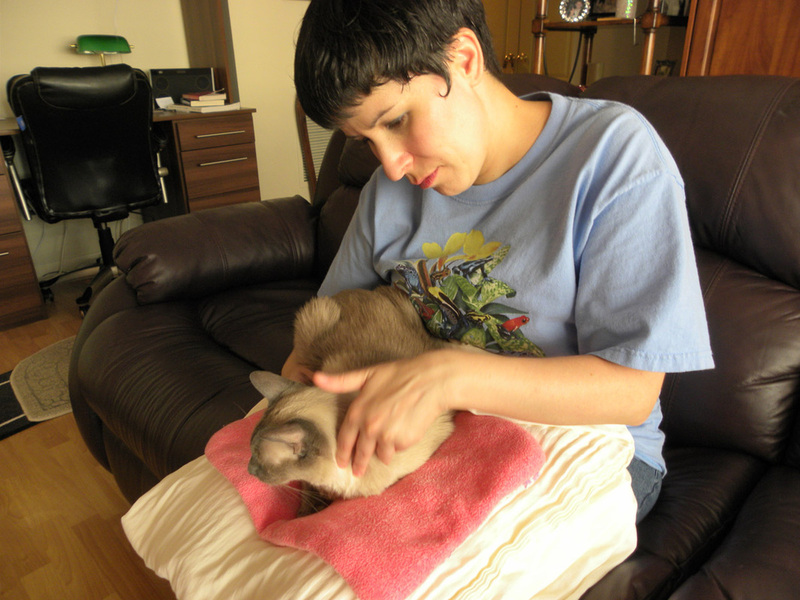 Regan performs a Swedish massage on Frodo, her Siamese cat.